Is Abu Dhabi about to get the news we’ve all been waiting for? A note from the museum via Twitter suggests that we will be hearing very good news, very soon…. 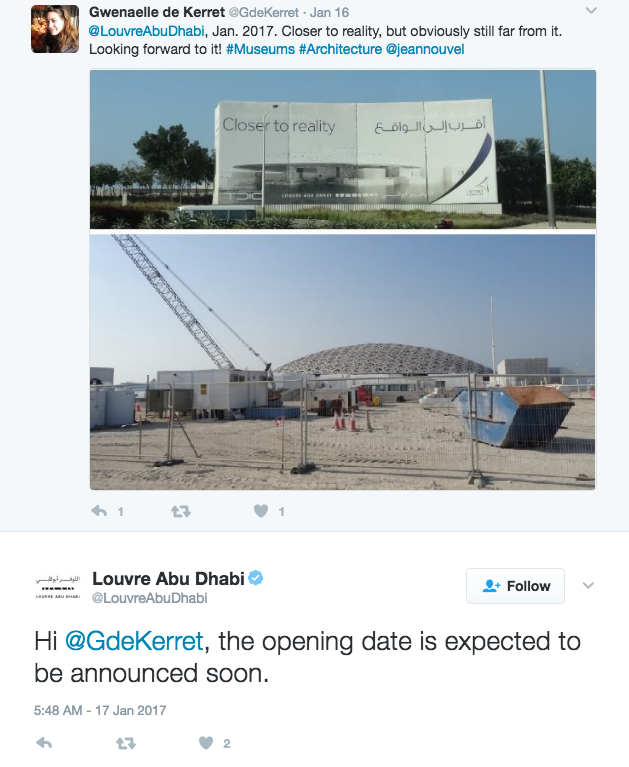 So yes, the Louvre is expected to open sometime later this year (and it sounds like we will know exactly when soon). The museum has been built to represent an Arab madina or city, and will feature 23 permanent galleries, temporary exhibition spaces, an auditorium, a children’s museum, restaurants and a retail centre. Guests can marvel at the “rain of light” interiors. Designed by architect Jean Nouvel, the 180 metre dome capping the space has been designed in such a way as to control the light and temperature inside and features geometric designs that will allow light to move across the space. The Louvre has commissioned two international artists – Giuseppe Penone and Jenny Holzer – to develop sculptures and installations that will be on display during the opening of the museum. In addition to that, the museum has acquired more than 600 works of art to date. Including series and collections, works from the permanent collection will be exhibited alongside 300 works loaned from 13 French institutions. It’s also important to note that works of art will be exhibited next to each other and will not be separated by region or time periods, to further highlight the concept of universal themes found throughout the world. We’ll keep you updated on the opening date and more when it’s all announced!